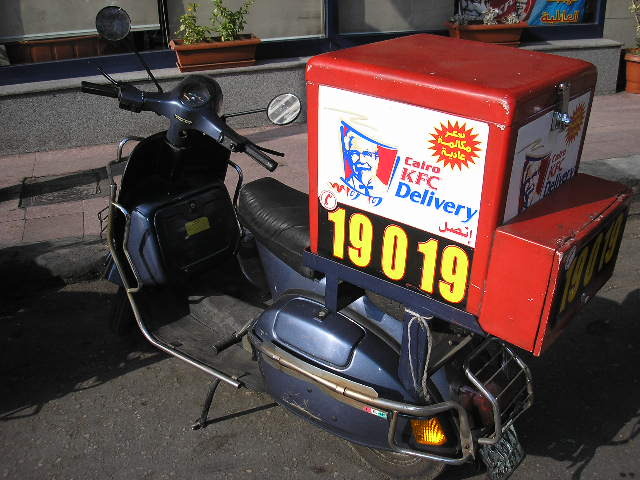 Kentucky Fried Chicken in Cairo, Egypt. I have been having some trouble finding good or acceptable food for me other than peanuts in Egypt, so I have gone to this KFC and had the Spicy Extra Crispy Chicken Dinner. It is not cheap and cost five dollars U.S. for this meal; I tried yesterday to cut the meal down only two chicken breast. I guess they do not understand the world breast so they gave me to backs. They also do not understand a queue or what “Extra Crispy” means, however I am very surprised at the really great quality of the food in this place. I am even more surprised to listen to the English Language Radio in the place and the person that was trying to give away or let a person win 500 Egyptian Pounds like an American Station. The normal person here on the street does not speak English; however, there are many things in English. I am feeling this is one of them class system cultural things, where the rich class makes the rules, therefore to separate themselves, they have many things in British English so the normal person has the feeling he does not compete. A class system is enforced by the…. Speak a special language method. Not looking a lower class person in the eye. Not talking to a lower class person.